We study biophysical systems where collective response and function emerge from a large collection of interacting components, with particular focus on the adaptive immune system and active matter. Both systems readily evade equilibrium constraints and often defy intuition. We use analytical and computational methods from statistical mechanics and many body physics to approach them, to explore non-equilibrium physics and to discover new states of living matter. 10/2017: Shenshen is giving a talk at the Physical Concepts and Computational Models in Immunology Symposium at MIT. 9/2017: The group is excited to participate in the QCBio Retreat in Santa Monica. 06/2017: Shenshen receives the Faculty Career Development Award from UCLA. Shenshen is broadly interested in how many-body systems solve problems. 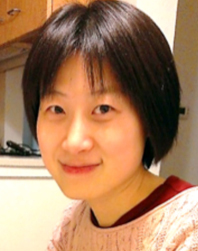 As she moved from Hong Kong to San Diego to Boston to Los Angeles, she worked to discover and resolve new puzzles in condensed matter physics, biological physics, immunology and areas between them. Read more. Copyright © 2019 UCLA Physics & Astronomy Department | Contact the webmaster.